I have been a very bad blogger this past two weeks. The weekends have been full to overflowing with activity, and not all of it has been of a pleasant nature. 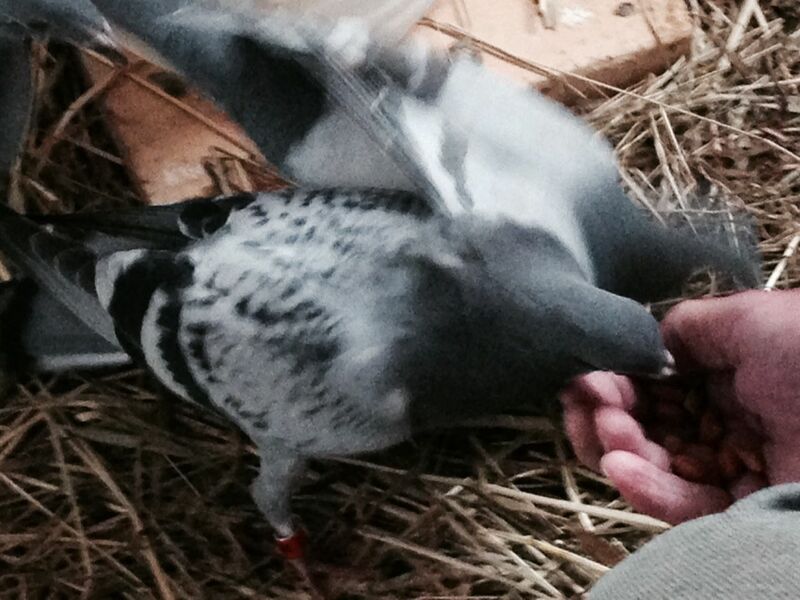 First, though, on the pleasant and positive side, John has become a newly fledged homing pigeon flyer. That’s probably not what they are called, but there it is. We have 18 homers, young ones, that he is training for eventual racing. They are fascinating creatures! I love them too, as I am a sucker for most animals. The whole homing pigeon thing is very involved, and we are lucky to have two or three really wonderful mentors in the area. The birds get “flown” every time it’s nice weather and we are around (and we plan ahead and don’t feed them first thing in the morning), which usually means on the weekends. It’s been up and down crazy, as during the first flight last weekend we weren’t sure they would all return. They flew around and around above the farm, and then perched in the trees above the loft, and sat and sat. But return they finally did, finding the correct door in the building, and with each successive flight the majority of them have learned to get home with more alacrity. This past Thursday, however, 3 of them failed to come back. John has to close the loft up at night so that no predators gain entry, and the ones not back are left to their own devices. A friend of ours from Round Pond, about a mile away, called last night and told us that 3 of our birds were eating like little piggies under his bird feeder! We couldn’t catch them then, but this morning two returned, looking the worse for wear, and then amazingly, the other one returned late this afternoon! I really didn’t think it would happen. They are so young, and they were not born here, so it makes it difficult for me to comprehend how they do it. The green time is finally upon us and it’s such a relief! This past winter seemed to drag out an exceptionally long time. The leaves are still a lighter shade of green right now, and it’s lovely to drive up the street and see everything filling out, in all shades, and leaves in all different sizes. 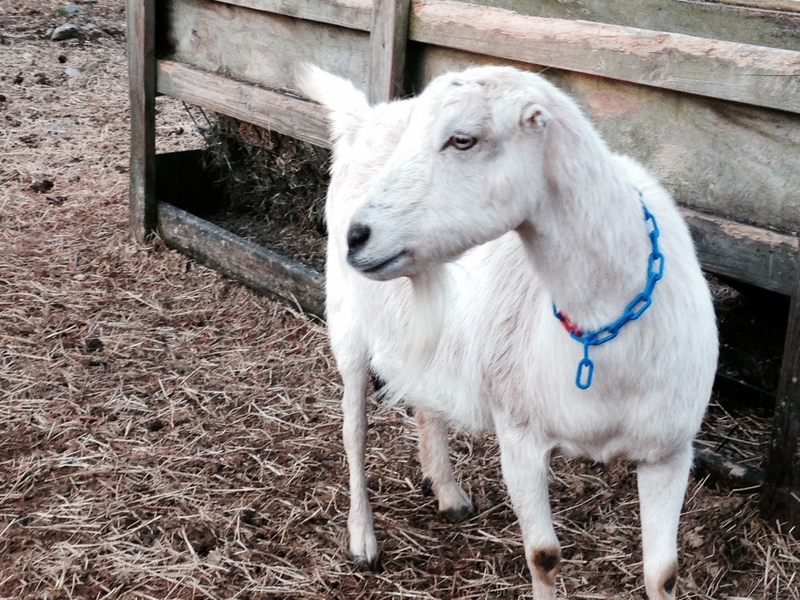 Meanwhile, the goat kids are growing like hot cakes. They have become a cohesive little gang, not always obeying their mothers anymore. It’s quite fun to watch. They are still loving their playtime at The Rock, but they also zip around doing sideways flips, kicking up their heels with big grins on their faces. 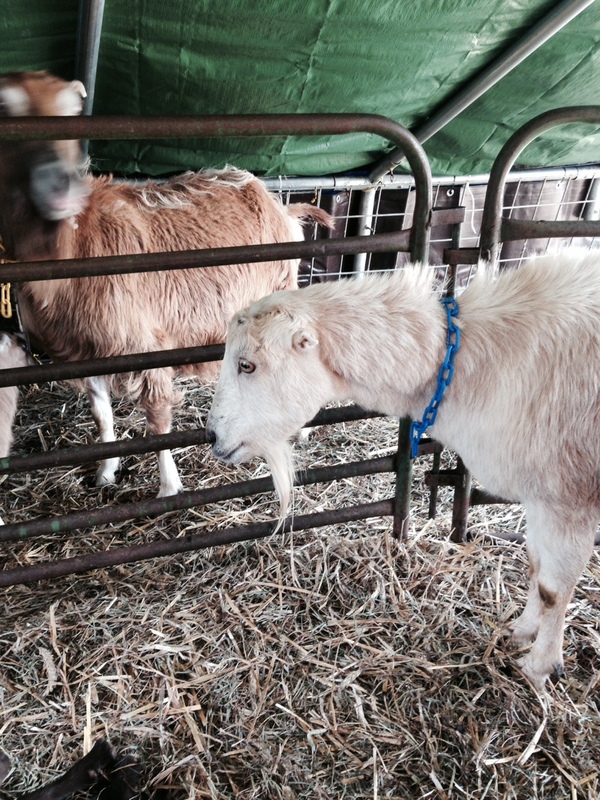 I am beginning to plan for weaning time, which means I will have to set up one side of the paddock to be kid-proof. That is definitely going to be a challenge. They are worse than lambs at weaning time, and many a goat baby has talked his or her mama into standing up close to the fence so they can get a nosh. Little beggars! Things are going well, in spite of the weather. 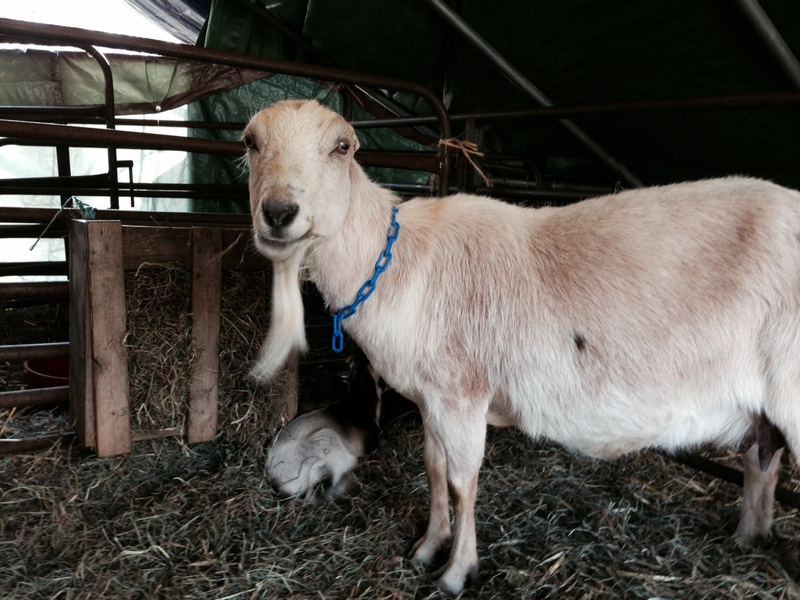 Pippi is doing well, and her babies are thriving. 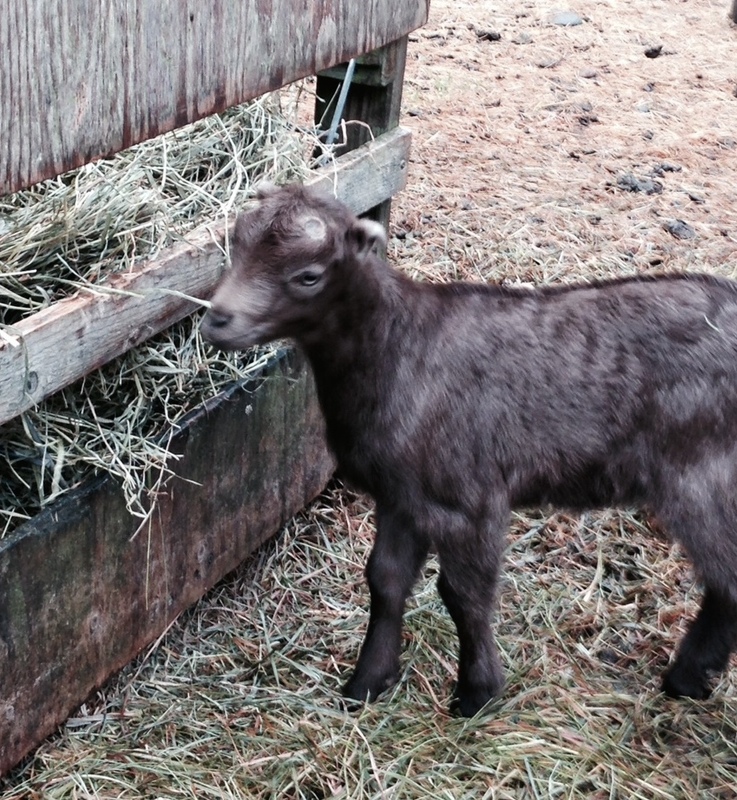 Little Brown girl is quite the playful one, and she is not as shy as her brother, Oreo boy. Pippi does not seem to eat quite as much as the other does, but she seems to be doing a little better every day. She stays a few minutes longer at the feeder each time, or almost each time. This coming weekend I will probably weigh Pippi’s babies, just to make sure that they are still gaining well. But judging from their activity levels, I would say they are doing really well! So for now, we keep watching. And hope for better weather! Downpours were definitely the rule for most of today. I thought things would lighten up around noon, but that did not happen. By 5 when I went out to do chores, it had stopped, and I was relieved to be able to feed everyone outside. I got an initial creep setup created yesterday afternoon in the kidding greenhouse. 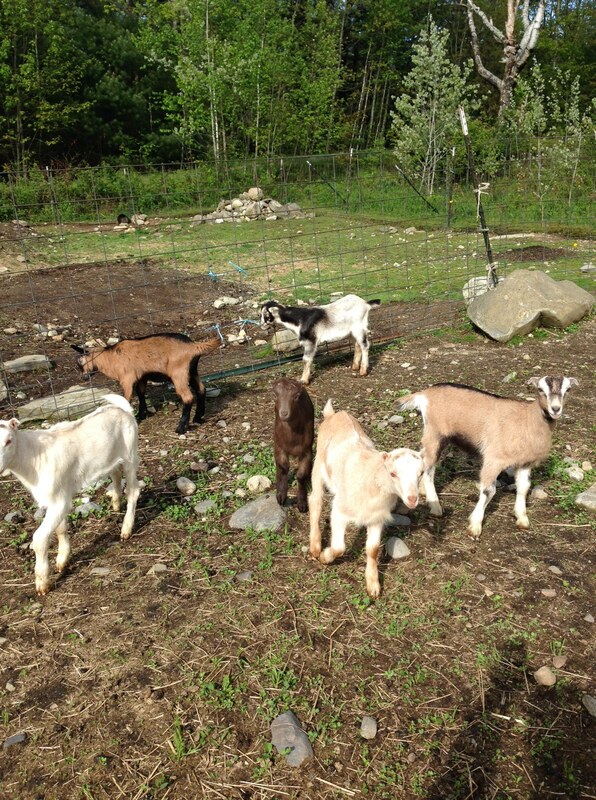 I have to replace one of the tubular panels tomorrow morning as it has a bent bottom bar, and I believe that the smaller goat kids could scramble under it and make a get-away (didn’t see that until this morning). I need the creep for them to be freely feeding, but I also need it so that I can block the access door and keep them in for shots, etc. I am almost there. I was glad to see the oldest two girls sleeping in there this morning when I went out, along with a couple of the littles. The bigger they get, the more they enjoy the room to spread out! The playtime at the rock this afternoon was epic after all the rain. I took a series of photos, even though I was thinking the whole time that I should be doing a little video. Oh well, it the slideshow goes in order, it should have the same overall effect :*) Unfortunately, the black flies are so bad that I have not been sharing in the playtime at the rock in the past few days… I need to keep that up so that hopefully I can handle the kids a little more easily. Soon. The spring has almost blossomed out, and soon we will move past the black flies. Really. And most of the day it was looking very grey and misty. Around 1 pm the sun really began to take over, and by the time I got home it was fabulously warm out. Fabulously black-fly infested as well! But it’s so lovely to be able to open the windows and enjoy the air that I really don’t mind. 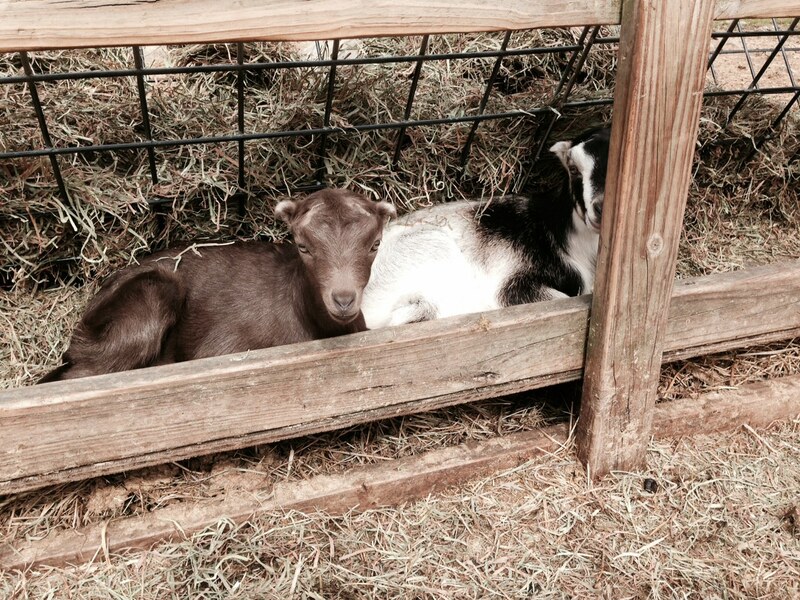 The goat babies are getting to be a rambunctious group, either in action every minute or else nestled up in the feed troughs near their mamas, and as cozy as they can be. I really have to create a creep for them this weekend, they need their own feed now as they are growing so fast (a creep is an area penned off from the mothers with an opening that only the little ones can get through). They all belly up to the trough and get into the grain along with the adults, but the moms don’t give them much of a chance! The other item on the agenda is CDT shots for the second bunch of kids. And maybe I will have some time to just sit on the rock and enjoy the playtime as well, if the rain isn’t too persistent. It seemed like such a long week. But it ended wonderfully, with a trip to the New Hampshire Sheep and Wool Show on Saturday with a couple of my spinning friends. We had a great time! It was the perfect size sheep and wool show. And after the morning rains, we didn’t need to worry about the weather. I came home with an amazing 3 pound Blue Faced Leicester fleece, which is quite an amazing find. I have never dealt with a raw BFL fleece, and I am very excited to spin it up. Today was so beautiful, breezy and warm, and I got about half of the fleece washed up. By the end of the week maybe I can get the rest of it finished. So my next spinning project may just be this gorgeous stuff. I can’t decide if I will blend it with mohair or not. Hmm. What a lovely problem! On the negative side, the black flies are now out in numbers. It is distressing for all the animals to spend too much time at the feeders, but such is the season. I am hopeful that it is not a long one. We have to break out the bug dope and do the best we can with the buggy pests. I hope it will not be a protracted season. Then we just have to move on to the mosquitos. Yay summer! Another couple of beautiful days here in midcoast Maine! 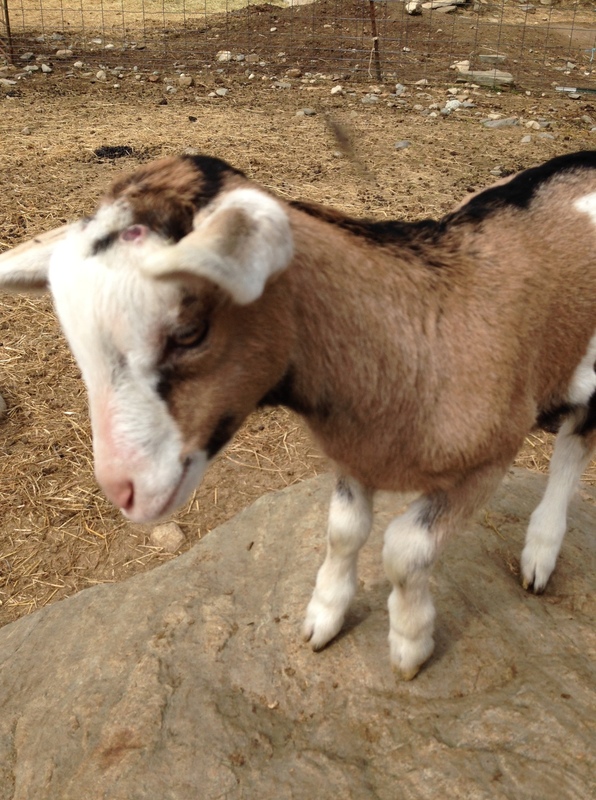 Can’t complain about the lovely temperatures, which, along with a stiff breeze, are sending all the tree pollens our way :*) The goats are having a blast, and the paddock is really hopping with the 8 little ones bouncing around. Yesterday I let Pippi and her babies out into the general population after her morning doses of calcium gluconate and another vitamin B shot. All three of them were thrilled. The babies just wanted to run wild, but Pippi is a very careful mama and she kept calling them back to her, keeping close tabs on them. She ate some grain at the feeder and John told me that he saw her at the hay pretty regularly all day. By yesterday afternoon her babies had truly become one with the kid gang, romping and playing out there like crazy. 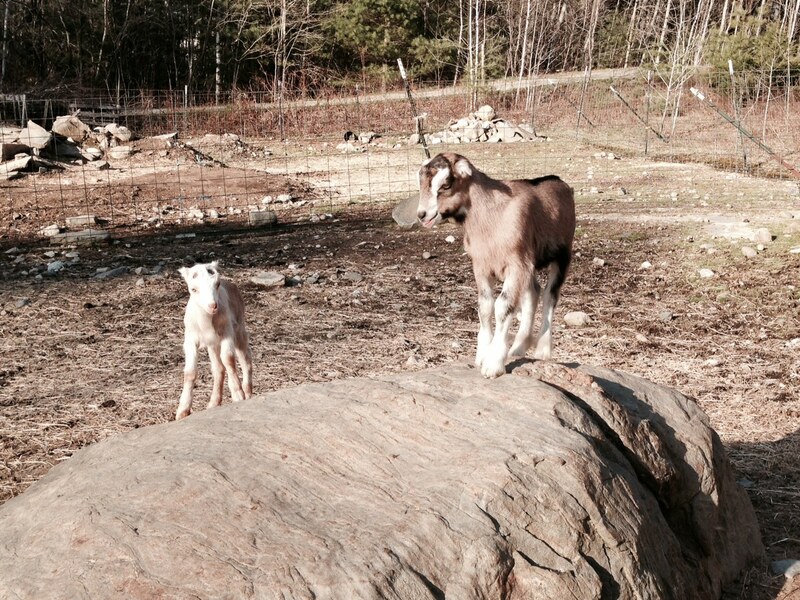 My favorite move from the goatie babies is the one where they walk up to one of the other moms and then just boing right up and onto the mama’s back, standing there like the king/queen of the mountain! Of course, most of the play still happens around the big rock, and I had a few chances to sit and let them rough me up a little. One of those little buggers can’t wait to jump up behind me and nibble on my hair. What a hoot! So we will wait and see how Pippi fares. She looked good today. Fingers crossed! Sweet Pippi. Well, she’s at least eating her hay. She is still just eating part of her grain. Luckily she doesn’t pick around the alfalfa pellets (which have loads of calcium). I always feed the alfalfa pellets starting about a month before kidding, and keep them going as long as I am milking. I don’t think that I was giving the girls enough of them, but at least Pippi is eating. I have pumped her full of calcium gluconate, and I think that we are going to give her one more treatment in the morning, along with her daily vitamin B shot, and then let her and the babies out. I am beginning to think that she needs some exercise, and a little more freedom will possibly increase her appetite. I weighed her babies tonight and found that her little girl has gained 2 lbs 6 oz and her little guy has gained a solid 2 lbs. Hopefully they will not be on her every minute after they get into the general population and she will have some peace to eat and get around. We will watch and see what happens. This afternoon was a beautiful one, and I caught a little bit of action at the Rock! 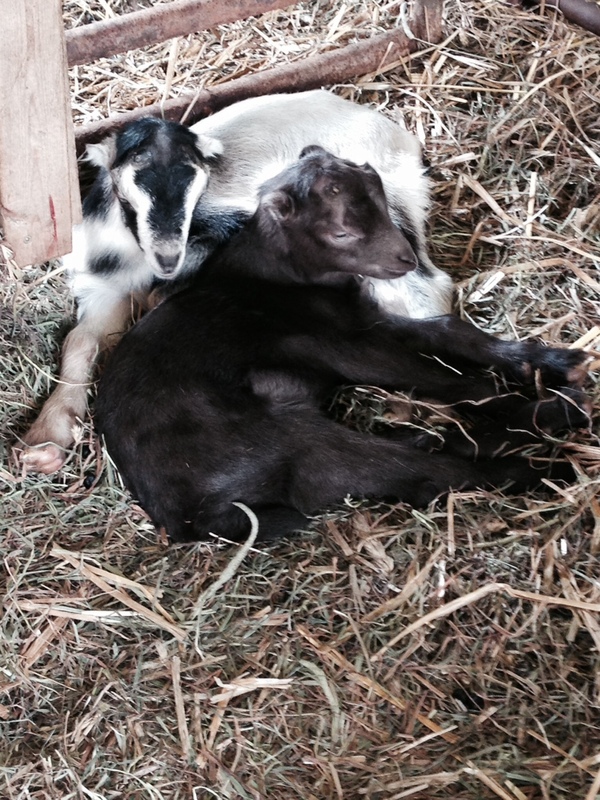 Kidding is all finished and it’s always a relief when the babies are on the ground. Now we get to worry about all the other things that can crop up! One of the things we are always watching for regarding the moms is something we call “milk fever,” but it’s not a fever, and it has to do with milk only in that the does need a lot of calcium to keep up the milk production. The birth process takes all the extra calcium stores in their bodies and when they start nursing their babies, the need for more sometimes exceeds what they can produce. Humans have bred domestic goats to be such heavy milkers that this is something we always need to be aware of (and I presume that this is a danger for milking cows as well, I know it is for sheep). So yesterday when I got home from the vet and went out to return disbudded babies to Pippi and SnowPea, I found that Pippi had not eaten much of her hay. I took her temperature and gave her a little molasses water and she seemed to perk up, but awhile later she did not appear to be any better, or any more inclined to eat. No temperature or other symptoms, so I began to treat her for hypocalcaemia, or milk fever, before things got any worse. This is not an easy treatment as it involves multiple injections of calcium gluconate, multiple times a day. I also have a calcium drench, but I have not been very successful with that in the past (it must be the foulest tasting stuff under the sun, they all shoot it out their noses and mouths and act like I have just given them poison. I got some into her, but not as much as I wanted). And so Pippi remains in her pen with her two gorgeous babies, and we have turned her into a giant pin cushion. Better than the alternative, and she is responding to the treatment, but not as quickly as we (of course) would like to see. She ate a little more last night and today, but we are not going to let her out into the general population until she is eating well. Her milk is still coming in and her buck and doe are doing very well, always have full bellies. I really don’t want two bottle babies! There frequently is a Wrinkle in the Force, especially with farm animals. And since today is May 4th and Star Wars Day, I can only say: May the Fourth Be With You! And hope that it is with Pippi as well. Yes, and it feels great! Today was mostly beautiful, with a few scattered and very dramatic showers. All in all, it was a keeper, however. When I got home I had a chance to spend time with my babies. The older 4 were playing around the rock and up on the hill. The littles were in the pens with the mamas and I sat in Pippi’s pen for awhile and played with her little buck and doe. They are as cute as buttons and starting to do the little jump and hop dance. Tomorrow I worm the moms in the jugs and their babies go for the great disbudding jaunt in the morning. If the weather is ok tomorrow afternoon I will let the moms and babies loose. And hope that SnowPea doesn’t need to fight with Elf again. Really.